Back in August, Aubrey from central North Carolina asked if I had any experience with purple honey. Specifically, he wanted to know what makes it purple. Although I have no personal experience, the idea of purple honey has fascinated me for years. Like a lot of folks, I first heard about it in The Secret Life of Bees by Sue Monk Kidd. In that book there is a brief reference to purple honey and elderberries. In truth, it seems that purple honey only appears in the southeastern states, that it appears mostly in dry years, that it accumulates in only some hives, and that the amount produced is usually limited to a few frames or a partial box. Many people claim that bees eating the fruit of blueberries, blackberries, or elderberries causes the color. Although bees are known to occasionally sip on ripe fruit (see below), beekeepers who have harvested purple honey claim that no berries were ripe when the purple honey was produced. Others claim that specific soil conditions affect the nectar of some plants causing it to turn purple, and other people write that, “bees have to work the blooms in a certain order in the make the honey purple.” Without some science to back them up, I can’t accept these conjectures either. I tend to side with the folks who say that purple honey comes from the flowers of the kudzu plant. For starters, kudzu and purple honey (sometimes called blue honey) share a geographical distribution in the southeast, whereas blueberries and elderberries are found everywhere. Also, purple honey is said to taste like grape jam and smell like grape soda—descriptions that are often applied to kudzu flowers as well. Furthermore, kudzu seems not to be a favorite of honey bees. But in dry years—especially during a summer dearth—the bees will forage on it to a limited extent. This comports with the fact that purple honey is most often collected in years of drought and never collected in large quantities. As I mentioned in several recent posts, honey bees often do well on invasive species, many of which have multiple advantages over native ones. With few natural enemies to weaken the invasives, they often thrive under conditions where the natives fail—and the honey bees are quick to notice. I’m sure someone has done a pollen analysis of purple honey to determine its floral source, but I haven’t been able to find one. In the meantime, I place my bets on the kudzu and I eagerly await my first taste of southern purple honey. Kudzu vine in flower, the most likely source of purple honey. 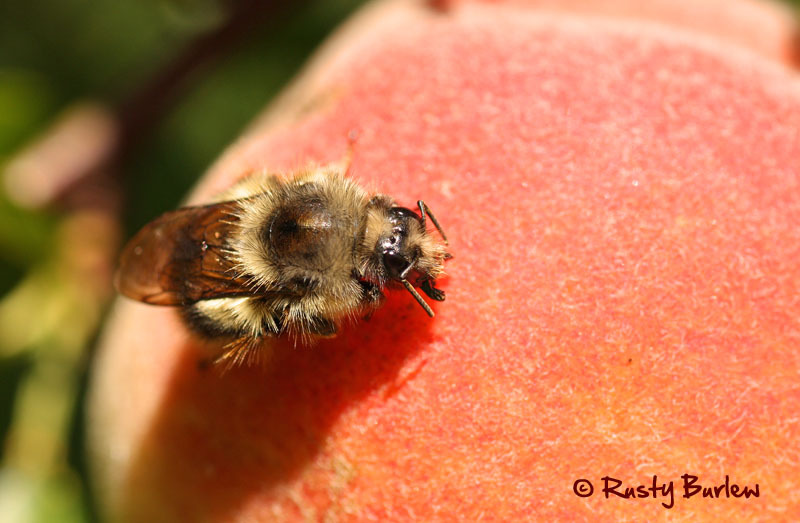 Bumble bee drinking peach juice during a fall nectar dearth. The bee left a small wet depression in the peach flesh. Hi Rusty. Last year while uncapping honey with a hot knife I began to smell what I thought was blueberry pie baking. I realized pretty quickly that it was coming from the very dark honey I was uncapping. When I tasted it, it had a definite blueberry taste. Later, when I bottled it and held it to the light, it had quite a bluish hue. It was, indeed, very dry last year when this honey was put up. There is a 5 acre blueberry patch within a couple hundred yards of that apiary so I figured the bees must have been getting juice from the berries themselves. It’s just a guess on my part, but the taste of blueberry was very strong in that honey. It was delicious! So I’m wrong about blueberry juice? I knew someone would disprove my theories. Next time, Jim, you have to save me a sample. On January 13, 1981 Dr. John Ambrose, at the time Associate Professor Entomology/Extension Apiculturist N.C. State, wrote, “we have done quite a bit of work on blue honey and our findings is that blue honey is produced from sourwood trees that grow in soils that have a high aluminum content. The color is a result of the combination of the aluminum and certain substances that are in the nectar of the sourwood. The nectar itself is not blue because the color change only occurs after the bees turn the nectar into the honey and make it much more acidic than was the nectar.” I live in the transition zone between sand and clay and have a few cells of the blue or purple honey mixed in to what is usually sourwood. By the way there is no Kudzu in my area. So I say let the debate continue. I, too, came across this report but dismissed it because many beekeepers with blue or purple honey swear there was no sourwood for miles around. I think the chemistry is plausible but I’m not sure that it is the sole reason for the colored honey. I’m also beginning to wonder if the descriptions “purple” and “blue” refer to the same thing or if, in fact, they are different types of honey from different sources. Maybe blue is from sourwood and purple is from kudzu? It gets curiouser and curiouser. Yes, the debate lives on. Interesting article. It is probably the source of the many references I’ve seen to sourwood, kudzu, titi and the possible chemistry involved. But why on earth hasn’t someone done a pollen analysis? A cautionary tale: I was asked about “kudzu honey” from a customer a few years ago. Seems they shelled out quite a few dollars to buy the stuff off of some guy here in Alabama. I had my doubts. After not TOO much trouble, I tracked the guy down and tracked the story down. This guy had purchased high fructose corn syrup CHEAP from a soda bottling company. It seems it already was flavored for grape soda. He opened the barrel and allowed free-feeding. The resultant “honey” was purple in color with the scent and flavor of grapes (like kudzu). Quite the entrepreneur, he bottled it and sold it under the kudzu honey label. Not cool! I tell this story to remind beekeepers that we have a moral obligation to keep it honest. Purple honey? Never seen it. Of course, I’e never come across Rhododendron honey either, and we know it exists. Anything is possible, but we don’t need dishonest folks jumping on the purple honey bandwagon. Thanks for your blog. Love it! The bad guys are always around, no doubt. But most of the beekeepers who discover blue honey in their hives will not part with it because it is so rare, and I am told, quite tasty. I’ve heard of dozens and dozens of beekeepers having just a frame or two of the stuff. Some have wondered if their bees were sick, if their honey had gone bad, if the bees had gotten into garbage, etc. Many of these people sounded fearful more than anything. I certainly believe them when they say they have or had it; I would just like to know how it occurs. By the way, I’ve heard the grape soda/HFCS story many times. Don’t know if I believe that one or not. They were also very generous to share a small jar with a few of us. I am a first year beekeeper. Started my 2 hives in spring of 2012 after taking class on keeping. I live in north Georgia about 15 miles above Canton to give an area. I did not expect anything from the hives my first year but low and behold I had an equivalent of a super full at the end of August. When I was uncapping the first frame I noticed how dark the honey was then I got a better look and found it to be purple. It was weird. I have two hives sitting right next to each other. One was all purple and the other had the normal yellow honey I am used to seeing. All total I got about 10 pint jars of the purple and the same for the yellow. Still have 4 or so pints of the purple. Looking forward to seeing what I get this year. Adding 6 more hives in March/April and have a huge blackberry patch located to put them in. 🙂 Good sized kudzu patch as well when the bloom comes. How does the purple stuff taste? I’m really intrigued. It is very good and kind of has a grape aftertaste. Everyone that has tried it has really liked it. I entered it in the local county fair and came in first. Still have the $4 winners check. 🙂 It is so dark that when I hold a LED flashlight to one side of the jar you can barely see the light on the other side. If I get more this year I plan on selling some. I did a count and I only have 3.5 jars of it left. Enjoyed this post. But this got me thinking. Can bees even make honey from fruit/fruit juice? I work an old-fashioned cider press at my nature center’s harvest festival and it draws tons of bees. Can they convert that to honey? If not, is it just food for the moment? Thanks for a great website! How can I purchase purple honey? This is a very frequent question, but I don’t know of anyone who sells it. I’m told that most of the beekeepers who actually harvest it, keep it for friends and family. If I get enough (or any) this year I will be selling some. You can sell some to me! We will need to wait and see if I even get any this year. I have gone from 2 hives to 6 so fingers are crossed. Hi, Rusty: I am a retired instructor who always wanted to be a beekeeper. Do you know of any beekeeper who is willing to teach me the skills of beekeeping? I am willing to live on their land as an unpaid worker in return for their knowledge of beekeeping. This year for the first time I am seeing my honey bees eating the raspberry fruit. They had also pollinated the flowers, but those are long gone. I looked closely and it appears they are “stabbing” their probiscus into the berry, not sure what they’re getting out of it. I had gotten rather behind in raspberry picking, and there are not many flowers left around. We are past due for a frost. Hope the “girls” get something out of the berries, as winter is coming. They are drinking the juice as if it were nectar. Bees and wasps frequently go for ripe fruit in the fall, especially when few flowers are available. In the US, there are no labeling standards for varietal honey. A beekeeper can label the variety however he pleases. One reason for this is that virtually no honey is totally from one source. So the sourwood nectar may be 80% or 50% or 20% of the total; the rest can be anything. My advice is to know your beekeeper, but also to really look at the honey. Sourwood honey should not be dark. In this case, the sourwood nectar was obviously overpowered by some other variety of nectar. The anise taste suggests it may have been some type of herb. I have always been interested in beekeeping. Is it hard to get started doing? Not so hard to get started, but hard to keep going. No it is not hard but it is an ongoing learning process. Even beekeepers who have been doing it for years learn new things. Best thing you can do is search for a bee club local to you. They will point you to pre training and support you when you start. You are looking at around $200 per hive to start but after that it isn’t that bad. I went from 2 hives to 10 currently and I am in my 3rd year. We really enjoy having them around. I did get the purple honey the first year but none since. I still have about 1.5 quart. I hate to use it because it is so rare to get it from your bees. My wife and I harvested some honey from our 2 hives today because we are almost out of last year’s harvest. We are located 2 miles south of the Fort Bragg training area in Raeford, NC. Both hives have 2 deep supers and I pulled 4 capped frames from one and 3 from the other leaving the rest for fall as they were not all capped. The hive I pulled the 4 frames from were all purple while the other hive was regular. And I mean beautiful purple, I’ve never seen anything like it. When in a jar it’s very dark like used motor oil, but spread it on a white plate and its very much purple. All in all we got 2 gallons of purple. I’m not aware of any large scale blueberry operations in our area but we do have kudzu however it has been a wet summer so your guess is as good as mine. The pigment that makes it purple is very powerful, after harvesting all the purple I didn’t wash the bottling bucket. I poured the regular golden honey in the top of the bucket through the 400 micron filter and out the bottom came a very dark product that looks the same as the purple honey when bottled but when spread on a white plate is more of a brown. We are debating selling it but don’t know where to start price-wise and besides I’m a bit of a pooh bear. I’d love to see a photo of it, if you happen to have one. I’m sure it is kudzu; blueberry honey is not purple at all, just plain honey-colored. Yeah, I still have about a quart of my purple honey. Mine happened the same as you. One hive normal yellow and the other purple. I don’t buy the kudzu source for the purple honey. If that were true, purple honey would not be such a rarity. Don’t know about NC bet Ga is covered with kudzu so purple honey should be everywhere if that was the source. So far I have only had it my first year and none since. I’m interested to know what your theory is on the source because I definitely see your point. On the other hand, if kudzu is not a bee favorite, they may only collect it in certain unusual situations, no matter how much is around. 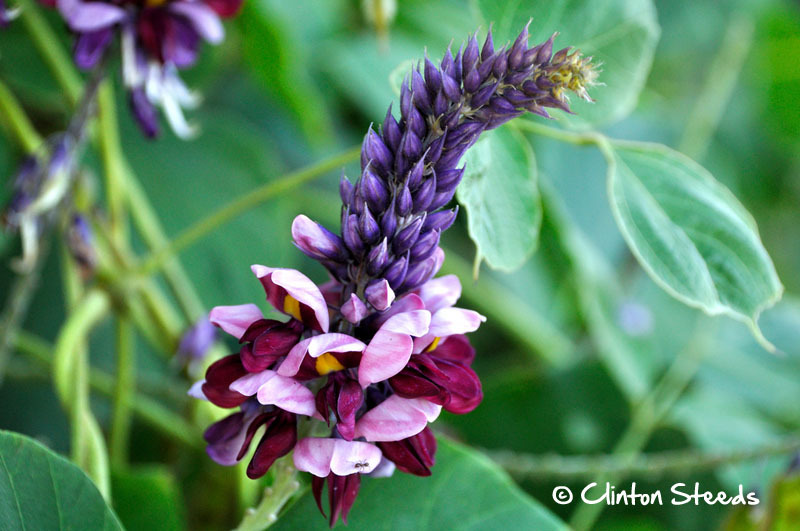 Although kudzu is plentiful, it has not been in bloom for several months in our area. I believe if the source was to be from kudzu, not only would purple honey be far more common, we would be seeing it in our hives in the early spring, when kudzu is at peak bloom here in NC. Unless you looked at your honey frequently during the season, it might not be obvious which type was collected when. In any case, if you think it’s not kudzu, I’m very interested to hear what you think it is. Also on the kudzu being the source. Kudzu flowers begin to appear in north Georgia in July and continue to bloom until September or October. That being the case, the bees would not be able to gather enough nectar from that source before harvest unless they are in the middle of a huge kudzu patch. Mine are not and I only know of a small patch about a mile away. Plus you would be harvesting just as the bloom starts. I am not saying that the bees do not get nectar from kudzu I just don’t think it is the source for purple honey. My harvest is done between the first of August and the middle. This year more towards the first. That way it gives plenty of time to treat for mites and senoma while getting the hive numbers up for winter. The nectar flow is low to non existent during this period which makes it a good time to treat. Then when the fall flow starts you are done and have a explosion of bee population to get ready for winter. I’ve got some photos but it will have to wait till Monday as I’m out of town. I had the same thought as Joe about kudzu. If it were kudzu you’d think it would be more popular and also not restricted to the US. Kudzu isn’t even from here. Others say they only feed on the kudzu during dry hearths but its been wet here this summer. I personally don’t care to know, I’d rather it continue to be a rare surprise. Awesome photos! Good write-up, too. Fascinating. Have you considered sending it to one of those labs that specialize in pollen identification? I wish someone would figure this out so we could stop with the arguments! I contacted Professor David Tarpy from the Department of Entomology, North Carolina State University and while he didn’t seem to interested in me sending in a sample for analysis he did point me towards the research his predecessor, Dr. John Ambrose did on the subject back in the 70’s. I went to the Bee University this year at Young Harris College located in north Georgia. It is put on in conjunction with the University of Georgia and offer lots of different classes on bees an bee related subjects. One of the classes I took was how to identify what most likely the source of the nectar soon to be honey is/was. You need a very very good microscope and even then the results can be inconclusive. They do it by the pollen in the honey. The identification of the pollen was more difficult than I expected. Me, being a dumbasp that day forgot to bring my purple. That is too bad! I’m just dying for a pollen analysis of this stuff and the suspense is killing me. I just removed a honey super yesterday here in Salem Oregon from a hive that I have in the middle of wild blackberries and I do believe these girls are packin berry juice in. A couple of the frames are only partially capped and the uncapped cells are full of, what looks like, blackberry juice. I scooped a spoonful out to taste and yes it’s honey consistency and yes has a honey taste but sure has flavors of blackberries. The color is dark dark red just like blackberry juice. I have not extracted yet but am anxious to see if the capped cells are similar and what the whole batch will be like. I was worried that it was either without a queen or was suffering from a disease/parasite. I was waiting for a warm day anyhow to open them up and throw on the hive-top feeders with a dose of honey bee healthy. When that day came and I got down inside the Irish there was no sign of a queen, no eggs, no brood, while the Italians had plenty of eggs and capped brood as well as a larger stock of capped honey. In an attempt to save them I dropped a frame of eggs from the Italians into the Irish but it was too late into the season and too cold. By the 3rd week of December the Irish had all died out. Now to come back to the purple honey. We disassembled the hive to salvage the remaining capped honey from the brood boxes and every single frame had some purple in it. Some frames where all capped and some where the typical brood frames with only the top 1/3 to 1/2 capped but every frame had purple, some entirely, some half and some just a small section. I may be wrong but doesn’t this indicate that they where bringing in this purple honey all season long? Don’t they have a system to fill the frames, center to outside or one side to the next rather than randomly? Because they had a medicated feeder on for a month before they all died I only took the capped honey, I don’t think they had the direction or the capability to produce honey from the feeder and cap it in there last few weeks without a queen. There was a good amount of thin, uncapped honey present that had the smell of honey bee healthy that was disposed of. What I did take out I’m keeping for my use only. Interesting. It does sound as though they collected it over an extended length of time. What does it taste like? It’s a full bodied honey kind of like avocado, but whereas avocado takes on a molasses likeness, the purple has a subtle fruity taste. I use full bodied not to describe its thickness or mouth feel but rather its complex profile. I liken it to a good red wine where the look, nose, attack, and finish all come together to create something unique. I searched on purple honey, because I was curious about it and found your blog. My husband keeps bees, and last year, we had some deep red honey that tasted exactly like cherry pie made with pie cherries. We tried to figure out what flower might make it do that, but couldn’t. It was delicious. Hoping you might have a lead. Thank you! I don’t have any idea, but maybe one of my readers does? We have been eagerly waiting for our kudzu to bloom. We’ve gotta harvest what’s already ready. But looks Like our 4 acres of blackberries covered in kudzu us due to bloom in the next couple of weeks. Crossing our fingers. Rusty, I’m reading The Secret Life of Bees and “The bees, they start sucking on that elderberry.” Not blueberries. I don’t keep bees, but it is so interesting. What is even more interesting is that elderberries produce no nectar. Elderberries are strictly a pollen plant for bees. Blueberries produce nectar, but it is an amber color. We extracted about 2 liters of deep purple honey from one hive last week, here in a rural part of Durham, NC. It has the color of blackberry syrup (not blue KoolAid) and has a nice, slightly sour, berry flavor to it. ‘Haven’t decided how much we’ll sell yet but it will be in small jars so we can spread it around. Well, I am certainly jealous. Maybe you could sell me one of your small jars? If you would like me to post a photo, you can email it to me here: rusty@honeybeesuite.com. I have blue honey, no kudzu or blueberries. 1st time ever. Rockingham N.C.
We have purple honey – which we call blood honey – from late or second growth goldenrod. There is a late flow in September and October for us. And I’m assuming goldenrod because that’s the only nectar source we know of in our area that time of year. Bees are seen to be busy in it! That is interesting. I’ve heard goldenrod honey described as dark but never purple. Still, I see what you mean. I have some purple honey from a keeper on Long Island. He has this interesting method. He plants a single source garden in a horseshoe shape and puts a small box inside the curve, so the bees have an abundant source of single flower right outside their door. The purple honey I got from him was sole-source (or nearly so) from elderberry. The person who described theirs as being like a red wine is on track it is very complex. This tastes like candy, specifically, it tastes like Australian red licorice, only much better and more complex.